How Will the Electronic Medical Record Change Medicine? 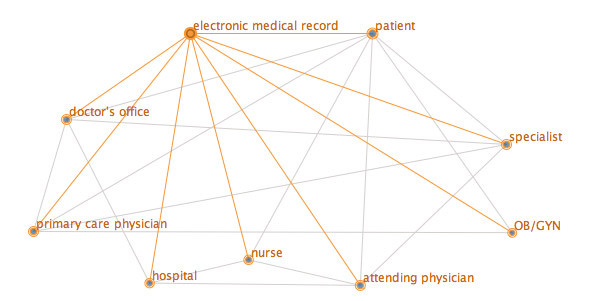 SOURCE: SP Visualizing some of the relationships created by an electronic medical record. With the advent of a new administration, advocates are poised to reform the United States’ broken healthcare system. But integral to improving care and reducing costs is a systems-oriented approach to providing medical care. Improving this “web of care” for patients is one part of the equation, but well-designed health information technology like electronic medical records will also improve the web of relationships between doctors. In this commentary, first published in the Hastings Center Report, physician and ethicist Joseph J. Fins explores the intangible benefits of digital records and communications. Several weeks ago, fifteen of my primary care-internist colleagues and I sat in a midtown skyscraper in a classroom fitted with a laptop computer for each of us. Coffee cups in hand, we embarked upon a two-hour class—the first installment of a ten-hour course—to learn to use a multispecialty electronic medical record (EMR). The EMR our medical center has decided to launch is elegant, with lots of pop-ups, color-coding, and an amazing ability to collect and generate data. Our instructors pointed out that the new system was more than just a computer to write notes or order prescriptions. Our practice has had that capability for years. The beautifully scribed notes of the past, sequestered in a doctor’s office or lost in transition in Medical Records, did little to disseminate knowledge or share the insights essential for patient care. No, this new system was different. It was a medical information superhighway. It connected you with colleagues throughout the medical center by means of a shared medical record. Between sips of coffee, we were told of the new system’s capabilities: If you want to know about your patient’s last visit to the urologist or send a pre-op clearance note to his cardiac surgeon, your colleague is but a click away. Order a drug that is incompatible with the patient’s medication list, and the EMR will warn you away from your choice and steer you clear of a pharmacologic mismatch. Beyond its capability to promote safety, it also can facilitate outcomes research. Although I was none too thrilled to trudge downtown for training, I must admit that typing up a mock patient visit on the computer was fun. Since it is not altogether different from ordering a book on Amazon or searching UpToDate for medical information, it was not entirely unfamiliar, but it was still novel for a middle-aged doc whose career in medicine began before computers, much less the advent of information systems. You see, I am part of that cusp boomer generation that came of age before the Internet. Although I am now wedded to a PDA at all hours of the day, night, and weekends, my worldview was shaped in an analog time right before the digital onslaught—now an almost premodern experience. In high school, my chemistry class was the last to use the slide rule. We thought they were cool and a marker of scientific sophistication, at least until the first hand-held calculators displaced them. By our senior year, physics was made simpler by my little Casio computer, but I’ll always be glad to have experienced the seventeenth-century charm of a slide rule. It might have been centuries old, but it taught you to appreciate logarithms in a way the Casio did not. In medical school, my class was the last to do pathology solely with glass slides and microscopes. The following year, an innovative pathology professor started to use primitive Apple computers to display some images. No longer were students wedded to one hundred prized slides that they lugged around in old wooden cases. The possibilities were limitless. Because I am of a certain age, the age of informatics has been trailing me and will chase my generation forever. This is especially true when it comes to the galloping arrival of the EMR. When we were residents in the late 1980s, we would pride ourselves on how our charts read and looked. The chart was a place to tell a patient’s story from our point of view. Although we had all been trained in the architecture of the medical note and the progression from Chief Complaint (CC) to History of Present Illness (HPI) on down to Assessment and Plan (A/P), each of us did it a bit differently. Each of us had our own voice. I recall marveling at the charting styles of my colleagues and professors: the long, obsessively complete note of the intern versus the almost aphoristic musings of the attending—the former chock full of unorganized information, and the latter synthetic in its encapsulation of the problem and plan of action. And in that transition, through our writings in the medical record, we all learned how to think as doctors. The notes were also often handsome. Although the rule was that all were to be written in black ink, some engaged in a degree of civil disobedience by expressing themselves in another color (myself included). I recall a pioneering female doctor-professor who used a fountain pen and wrote in a turquoise hue. Each of these notes was reflective of a grand personality and as recognizable as the author’s signature. As a resident, I used to “specialize” in notes depicting occurrences of angina. In the premodern age of fancy twelve-lead cardiograms that would print out the whole thing out on a single sheet, we would run long strips one lead at a time. Later we would collect the strips and label them carefully. As an intern I learned from a resident how to cut the strips into usable samples using a credit card as a template for gauging the width. Once placed in the chart, these notes were a thing of beauty and a testament to our earnest efforts. But as beautiful as my EKGs were, they were of limited utility. In retrospect, they are now reminiscent of the quaint temperature charts of the late nineteenth century, so carefully drawn by our predecessors. Because they were unofficial EKGs, unread by cardiology, they did not always make their way into the permanent medical record. If they did creep through, they—along with the entire chart—were often “lost to follow-up” in Medical Records until the chart had been “broken down” for billing purposes. That would work out fine if the patient spaced his admissions for angina to the hospital to once every three or four weeks, but not if there was a rapid readmission. In that case, the chart was often unavailable, with no one having access to a current cardiogram or list of meds. It is for these reasons that my rational self applauds the new electronic medical record. The beautifully scribed notes of the past, sequestered in a doctor’s office or lost in transition in Medical Records, did little to disseminate knowledge or share the insights essential for patient care. With the EMR, data is always available in the service of patients. Our ability to communicate findings has no hiatus. But still, my romantic self worried that something has been lost with the homogenization of the medical record. Our instructors told us that we could write whatever we wanted in a particular box as “free text.” In the past, we were free to write and construct the medical narrative as we saw fit. Today, it seems we need to be liberated from a grid that has the potential to depersonalize the medical record by squelching creativity and silencing helpful narratives. The creation of this virtual yet patient-specific social network will force us to create a new balance between privacy and information exchange, both as individual physicians and as members of practice communities. While the medical record could never be equated with the doctor-patient encounter itself, it was the narrative reflection of that dyad by one of its participants. As we think about pop-ups and automated prompts, will our engagement with patients become similarly muted of affect? Will it deprive us of an empathic response? This concern is more than the well-rehearsed literature, dating back to the 1990s, about having a computer in the exam room. It is about the sentience of an information system, a sentience with which physicians might engage at the expense of engagement with patients. Will the EMR turn the doctor-patient relationship into a new sort of triad, with the EMR itself now acting as proxy for all who care for the patient? If the EMR is the vector of information out to colleagues and the recipient of data from medical cyberspace, what does that mean for the privacy, indeed the intimacy, of our relationship with patients? In our class, we learned that we would have the option of making some notes “sensitive” and off-limits to other readers unless they are specifically authorized. We heard that the psychiatrists and obstetrician-gynecologists are availing themselves of this option. If it now takes a medical village—and a shared medical record to provide care—are we therefore also responsible for each other’s work? And if so, are we obliged to collectively share information, sensitive or not, with each other? My psychiatrist and obstetrician-gynecologist colleagues’ urge to demarcate special sections of the EMR speaks to some of these issues. But it also betrays a deeper concern about how the EMR might transform the doctor-patient relationship. Its ability to morph the medical record from a practice-based document into a communal one will move patient care into a social network, beyond any exam room and outside the scope of any single provider or solitary doctor-patient relationship. The creation of this virtual yet patient-specific social network will force us to create a new balance between privacy and information exchange, both as individual physicians and as members of practice communities. My first morning in clinic with the new system put some of these speculative concerns about the EMR to the test. As a primary care doc, one of my biggest challenges is coordinating patient care and keeping abreast of all the other doctors my patients may be seeing. The EMR solved this problem. With a simple click on “chart review” I could see which physicians my patients had consulted and get accurate, up-to-date information. This was far better than relying solely on incomplete or poorly recalled patient histories about what happened between visits or being at the mercy of specialty consultants who sometimes send a note outlining their findings. Now I had access to their medical records and their thoughts in real time. I felt empowered by this wealth of information and my newfound ability to share recommendations with colleagues. This became immediately clear when I “signed” a note for a patient needing pre-op clearance for a gynecological procedure. My electronic signature turned the medical record into a virtual e-mail. The gynecologist had immediate access to my suggestions and a way to get back to me. But it was more than medical e-mail. I also had the sense that a window on my practice was now opened. I am now writing for a wider audience than before. My charts are now public documents in the context of the local medical community where one’s local reputation as a clinician is forged. All care is now witnessed, open to local peer review: others can read what I write and assess its content, clinical judgment, and quality. The EMR will never compare with the aesthetics of the old paper chart, but it has a functional capacity that the conventional medical record will never have. Like the paperback, which supplanted the medieval illuminated manuscript, the EMR has a mass appeal; within medical communities, it will distribute information beyond a sequestered few to those who actually need to be informed. I still lament the passing of the beautifully scribed medical record—and remain concerned about confidentiality and the doctor-patient relationship—but I also welcome what information technology can do to minimize discontinuities of care and the medical errors that stem from miscommunication. Most of all, I welcome what the EMR has done to reestablish relationships with colleagues. As dispersed as we are in our separate clinics across the medical center, we are actually talking to each other and sharing our charts. This web of care is already appreciated as an operational improvement over the status quo. I suspect it will also become a way to collectively reaffirm and redefine our values as a healing community. Linked through technology, we can now articulate what constitutes scientifically sound and humanistically informed medical practice in the information age. Joseph J. Fins, M.D., F.A.C.P. is Chief of the Division of Medical Ethics at Weill Medical College of Cornell University where he serves as Professor of Medicine, Professor of Public Health and Professor of Medicine in Psychiatry. With the advent of a new administration, advocates are poised to reform the United States' broken healthcare system. But integral to improving care and reducing costs is a systems-oriented approach to providing medical care. Improving this "web of care" for patients is one part of the equation, but well-designed health information technology like electronic medical records will also improve the web of relationships between doctors. In this commentary, first published in the Hastings Center Report, physician and ethicist Joseph J. Fins explores the intangible benefits of digital records and communications. Several weeks ago, fifteen of my primary care-internist colleagues and I sat in a midtown skyscraper in a classroom fitted with a laptop computer for each of us. Coffee cups in hand, we embarked upon a two-hour class—the first installment of a ten-hour course—to learn to use a multispecialty electronic medical record (EMR). No, this new system was different. It was a medical information superhighway. It connected you with colleagues throughout the medical center by means of a shared medical record. Between sips of coffee, we were told of the new system’s capabilities: If you want to know about your patient’s last visit to the urologist or send a pre-op clearance note to his cardiac surgeon, your colleague is but a click away. Order a drug that is incompatible with the patient’s medication list, and the EMR will warn you away from your choice and steer you clear of a pharmacologic mismatch. Beyond its capability to promote safety, it also can facilitate outcomes research. Although I was none too thrilled to trudge downtown for training, I must admit that typing up a mock patient visit on the computer was fun. Since it is not altogether different from ordering a book on Amazon or searching UpToDate for medical information, it was not entirely unfamiliar, but it was still novel for a middle-aged doc whose career in medicine began before computers, much less the advent of information systems. You see, I am part of that cusp boomer generation that came of age before the Internet. Although I am now wedded to a PDA at all hours of the day, night, and weekends, my worldview was shaped in an analog time right before the digital onslaught—now an almost premodern experience. In high school, my chemistry class was the last to use the slide rule. We thought they were cool and a marker of scientific sophistication, at least until the first hand-held calculators displaced them. By our senior year, physics was made simpler by my little Casio computer, but I’ll always be glad to have experienced the seventeenth-century charm of a slide rule. It might have been centuries old, but it taught you to appreciate logarithms in a way the Casio did not. In medical school, my class was the last to do pathology solely with glass slides and microscopes. The following year, an innovative pathology professor started to use primitive Apple computers to display some images. No longer were students wedded to one hundred prized slides that they lugged around in old wooden cases. The possibilities were limitless. Because I am of a certain age, the age of informatics has been trailing me and will chase my generation forever. This is especially true when it comes to the galloping arrival of the EMR. When we were residents in the late 1980s, we would pride ourselves on how our charts read and looked. The chart was a place to tell a patient’s story from our point of view. Although we had all been trained in the architecture of the medical note and the progression from Chief Complaint (CC) to History of Present Illness (HPI) on down to Assessment and Plan (A/P), each of us did it a bit differently. Each of us had our own voice. I recall marveling at the charting styles of my colleagues and professors: the long, obsessively complete note of the intern versus the almost aphoristic musings of the attending—the former chock full of unorganized information, and the latter synthetic in its encapsulation of the problem and plan of action. And in that transition, through our writings in the medical record, we all learned how to think as doctors. The notes were also often handsome. Although the rule was that all were to be written in black ink, some engaged in a degree of civil disobedience by expressing themselves in another color (myself included). I recall a pioneering female doctor-professor who used a fountain pen and wrote in a turquoise hue. Each of these notes was reflective of a grand personality and as recognizable as the author’s signature. As a resident, I used to “specialize” in notes depicting occurrences of angina. In the premodern age of fancy twelve-lead cardiograms that would print out the whole thing out on a single sheet, we would run long strips one lead at a time. Later we would collect the strips and label them carefully. As an intern I learned from a resident how to cut the strips into usable samples using a credit card as a template for gauging the width. Once placed in the chart, these notes were a thing of beauty and a testament to our earnest efforts. But as beautiful as my EKGs were, they were of limited utility. In retrospect, they are now reminiscent of the quaint temperature charts of the late nineteenth century, so carefully drawn by our predecessors. Because they were unofficial EKGs, unread by cardiology, they did not always make their way into the permanent medical record. If they did creep through, they—along with the entire chart—were often “lost to follow-up” in Medical Records until the chart had been “broken down” for billing purposes. That would work out fine if the patient spaced his admissions for angina to the hospital to once every three or four weeks, but not if there was a rapid readmission. In that case, the chart was often unavailable, with no one having access to a current cardiogram or list of meds. It is for these reasons that my rational self applauds the new electronic medical record. The beautifully scribed notes of the past, sequestered in a doctor’s office or lost in transition in Medical Records, did little to disseminate knowledge or share the insights essential for patient care. With the EMR, data is always available in the service of patients. Our ability to communicate findings has no hiatus. But still, my romantic self worried that something has been lost with the homogenization of the medical record. Our instructors told us that we could write whatever we wanted in a particular box as “free text.” In the past, we were free to write and construct the medical narrative as we saw fit. Today, it seems we need to be liberated from a grid that has the potential to depersonalize the medical record by squelching creativity and silencing helpful narratives.